education or to request a financial aid application packet, please contact Michael Kirchmaier, Director of Financial Aid & Scholarships. Estimate your cost of attendance using the Net Price Calculator. Get additional information about admissions, enrollment, retention and graduation rates, net price, and more in College Navigator, a free consumer information tool designed by the National Center for Education Statistics, to help students, parents, high school counselors, and others get information about over 7,000 colleges. *All rates subject to change. Please contact us for more information. The access fee, an annual assessment, covers your dormitory or lounge key, your required College ID, Library ID, and other miscellaneous items. Assessed Fall semester for Religious Studies A and MDiv students only. There are no refunds after the fourth week of the semester. Additionally, a student who withdraws from the school and fails to do so in the prescribed manner will not be entitled to any refund. Grant: does not have to be repaid. Under the Federal Supplementary Educational Opportunity Grant (FSEOG) program, limited federal funds are available to students. Grants are awarded according to school and federal guidelines, based on financial need. For your convenience, the HCHC Office of Financial Aid has prepared a document that allows students to quickly complete all of the forms necessary to apply for Federal Student Aid. If you would like this document to be emailed directly to you, please send us a request. The Teacher Assistantship Program provides students with part-time positions assisting full-time faculty members. These assistantships are restricted to full-time students whose cumulative grade point average is at least a 3.00, or “B,” and who demonstrate financial need. Teacher Assistants may work as many as 40 hours per semester at a maximum rate of 5 hours per week while classes are in session. Individual faculty members in conjunction with the Office of Financial Aid will select candidates for this program. For more information, please email David Volz, Director of Human Resources, at dvolz@hchc.edu. The Work Study Program offers a variety of limited part-time employment opportunities on campus. Full-time students are selected based on demonstrated financial need and the availability of positions. Each student participating in this program may work up to 20 hours per week when school is in session. The Office of Human Resources assigns work study jobs. For more information, please email David Volz, Director of Human Resources, at dvolz@hchc.edu. Many states offer scholarships and/or loans to their residents who wish to attend schools in their state. However, some states offer scholarships to their residents to attend schools in another state. The following states offer such “portable” aid programs: Connecticut, Rhode Island, Vermont, Pennsylvania, and the District of Columbia. Students may obtain further information directly from the state agency responsible for such programs. Contributions to the Hellenic College Holy Cross endowed funds have been graciously provided by our generous donors for more than 76 years. These accumulated funds are awarded at the discretion of the faculty and the Office of Financial Aid to provide financial support where it is needed the most to full-time students. At times, the endowed funds may be exchanged for previously awarded general grant funds. This exchange will recognize the portion of a grant that was funded by a donor and, since it is an exchange, in most cases, the total aid a student receives will not change. All non-Hellenic College scholarships will be applied first before any Hellenic College scholarships. Generally, outside scholarships are used to fill unmet need. If there is no remaining unmet need, the financial aid award offered may be adjusted. All outside scholarships must be reported to the Office of Financial Aid. Again, the HCHC Financial Aid & Scholarships Office will not award any scholarships to HCHC students unless the office has received the FAFSA-generated “Student Aid Report” and the HCHC “Estimated Award Letter” signed by the student. There will be no exceptions to this rule. 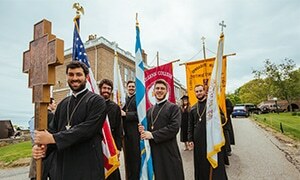 The Chrysostom Scholarship operates in conjunction with the St. John Chrysostom Oratorical Festival that takes place annually in the Greek Orthodox Archdiocese of America. Finalists in the senior and junior divisions at the parish, district, metropolis, and national levels of competition are eligible to receive a Chrysostom Scholarship to Hellenic College. This scholarship provides awards ranging from $2,500 to $30,000 per year. The award structure is outlined in the terms and conditions. The Chrysostom Scholarship is intended to afford young men and women the opportunity to continue their education in an Orthodox Christian environment while also encouraging more parishes to participate in the Oratorical Festival. Eligibility for the Chrysostom Scholarship does not guarantee admission to Hellenic College. Regular admission requirements must be met. Scholarships will be awarded when acceptance is offered. After admission, students must maintain a 3.0 GPA and be in compliance with the code of conduct specified in the student handbook in order for their awards to continue beyond the first year of study. Prospective students are encouraged to contact the Admissions Office at admissions@hchc.edu or (617) 850-1285. The Elementary Education Scholarship at Hellenic College is awarded to new freshman and transfer students who declare an Elementary Education major. Scholarships are awarded annually to high achieving students who have shown a dedication to learning and a passion for teaching. This scholarship is valued at $2,500 per academic year and can be renewed each year for up to four years. Students are encouraged to complete their application to the College before completing the scholarship application. Please answer one of the questions below. Each answer should be no longer than 350 words. Your responses should demonstrate evidence of your ability to articulate a critical understanding of education and your mastery of written language. What do you see as the most important issue in education today? How do you see teachers playing a role in addressing that issue? If you could make one contribution to the field of education, what would it be? Why would you like to be a student in this particular elementary education program? To apply, please send your 350-word essay to admissions@hchc.edu, indicating the question to which you will be responding. To learn more, please contact the Office of Admissions at 617.850.1260 or admissions@hchc.edu. The Office of Financial Aid and Scholarships is here to help you find as many scholarships from outside sources as possible. Please reference our list of Outside Scholarships for additional information. This list is regularly updated. Hellenic College Holy Cross students and parents are eligible to apply for the Title IV federal student loan programs such as the Subsidized Stafford, Unsubsidized Stafford, and Parent/Grad Plus loans through the William D. Ford Direct Loan program with the U.S. Department of Education. Federal loans are generally lower-interest rate loans that offer students and parents a grace period in which payments are not due, as well as multiple repayment plans. Whether you are a first-time borrower or a continuing student borrower, you may apply for a Direct Loan by completing a Free Application for Federal Student Aid (FAFSA) and electronically signing a Master Promissory Note (MPN). The U.S. Department of Education requires that all students wishing to borrow under the federal Stafford loan program participate in loan entrance counseling before receiving funds. To help you satisfy this requirement, visit the Direct Loan website. Please note that to complete this entrance counseling and exam, you will need your FAFSA PIN number to access your loan documentation. There are two types of federal Stafford loans – subsidized and unsubsidized. will be based in part on your financial need. This loan has a fixed interest rate of 5.05% for undergraduate loans disbursed between July 1, 2018, and July 1, 2019.
your financial need. This loan has a fixed interest rate of 5.05% for undergraduate loans and 6.6% for graduate loans disbursed between July 1, 2018, and July 1, 2019. These loan payments are deferred while you are enrolled in school. However, once you graduate or fall below a half-time credit load (undergraduate, 6 quarter credit hours per semester; graduate, 2 or 4 quarter credit hours depending on your program), you will enter into a “grace” period of 6 months before your repayments begin. Once this period has expired, you will be required to begin making payments on your student loans. Important Direct Loan information is also accessible on the U.S. Department of Education Federal Student Aid website. Parent PLUS loans are only available to the parent(s) of a dependent undergraduate students enrolled at least half-time and who meet all the eligibility requirements for federal student aid programs. Parents of dependent students wishing to apply must complete the online PLUS loan request which includes a credit check on the Direct Loan website. Parent PLUS loans have a fixed interest rate of 7.6% for loans disbursed between July 1, 2018, and July 1, 2019. Parents are responsible for repaying Parent PLUS loans once the loan is fully disbursed but have the option to defer payments as long as their child remains enrolled in at least a half-time status. Interest on the loan will continue to accrue while the student is in school and during any period of forbearance or deferment. Parents have a number of repayment options available to them based on their individual borrower needs. The Federal Direct Graduate PLUS Loan is a fixed interest loan program that enables graduate students to borrow directly from the U.S. Department of Education to help pay for their educational expenses. Graduate PLUS loans are only available to graduate students who are enrolled at least half time and who meet all the eligibility requirements for federal student aid programs. Graduate PLUS loans have a fixed interest rate of 7.6% for loans disbursed between July 1, 2018, and July 1, 2019. Students are responsible for repaying Graduate PLUS loans while they are enrolled in school but have the option to defer payments as long as they remain in at least a half-time status. Interest on the loan will continue to accrue while the student is in school and during any period of forbearance or deferment. Students also have a number of repayment options available to them based on their individual borrower needs.